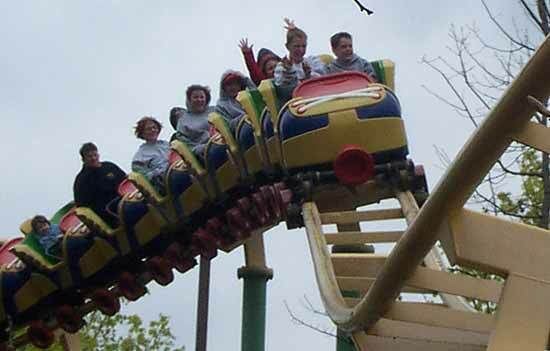 1990 saw Vekoma launching another very successful product line. First known as the MK-700J, it started with a much simpler low load track design that does not need a spine except when crossing other track segments or when support columns cannot be installed. In those sections, the regular MK-700 track is used. For the train, they went to a simple two across car that allow an adult to sit next to their kid and with a ratcheting lap bar per row to secure the riders. This allowed kids as small as 36 inches to ride with an adult. The first MK-700J was the Roller Skater at Meli Park and it opened in 1990. It had a large 1099 feet long layout and featured a 42.7 feet tall lift. 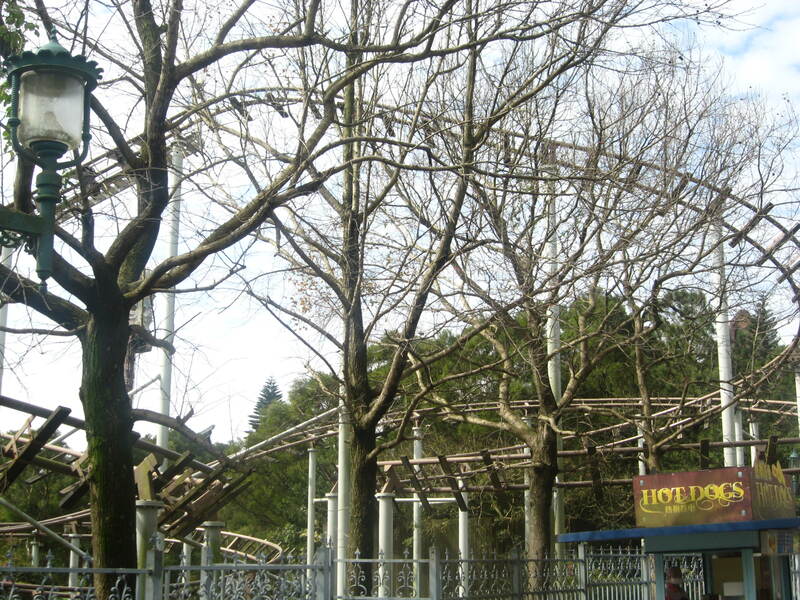 The ride still stands at Meli Park new identity: Plopsaland de Panne (Adinkerke- De Panne, Belgium). The MK-700J nickname remained the Roller Skater, due to the funny shape of the car on the prototype, which were patterned after 1950’s roller skates, complete with shoe laces. Most of the MK-700J use tire driven lifts, but a few installations have traditional chain lifts. The line was renamed today to “Junior Coaster” and the original Roller Skater marketed as a Junior Coaster 335m (335 meters, the length of the track). Our friend Flex provided us with this great picture of the prototype Junior Coaster at Plopsaland de Panne. As you can see, it was rethemed with various household items and the train goes through a washing machine at one point. 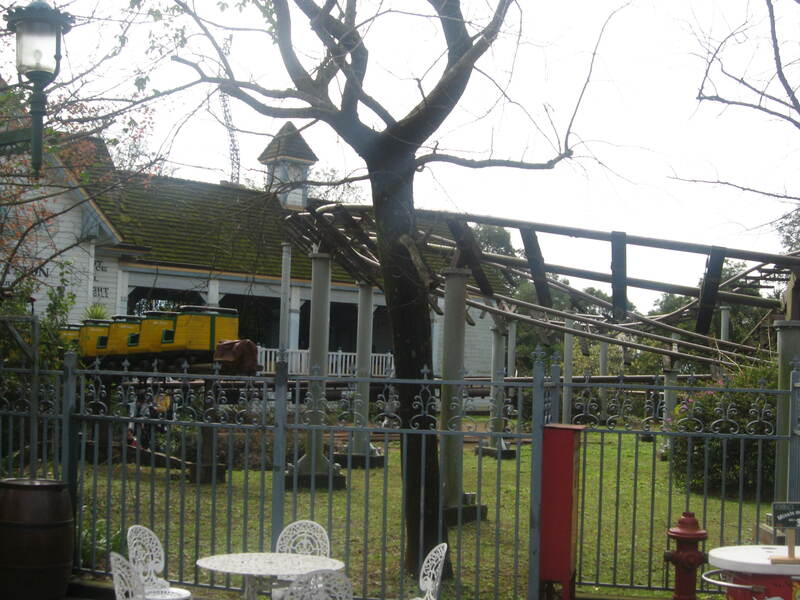 This is a Junior Coaster 335m installed in 1993 at Leofoo Village (Kuanhsi Chen, Taiwan). This installation is in the Old West area of the theme park and is known as Little Rattler. 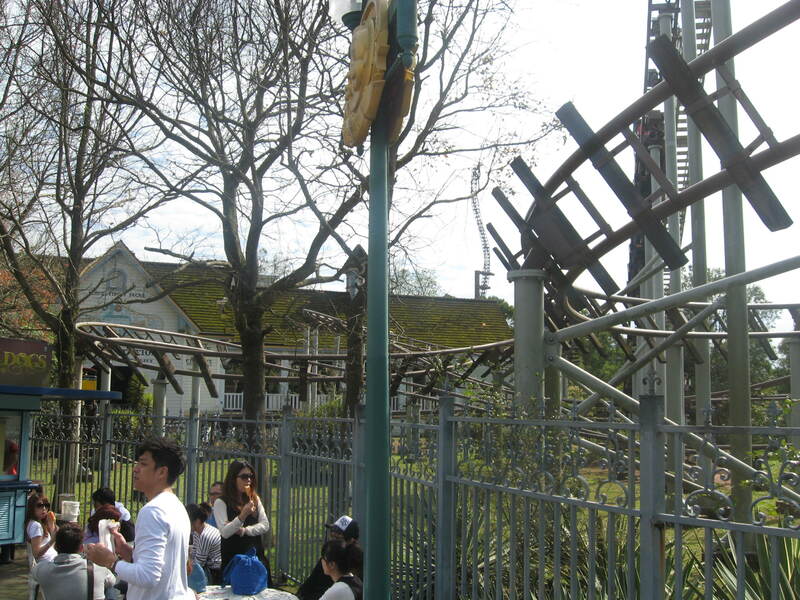 At the park request, Vekoma built brackets on the track so themed railroad ties could be bolted. 1991 saw Vekoma extending the MK-700J line with both custom installations and a new smaller compact 679 feet long layout. 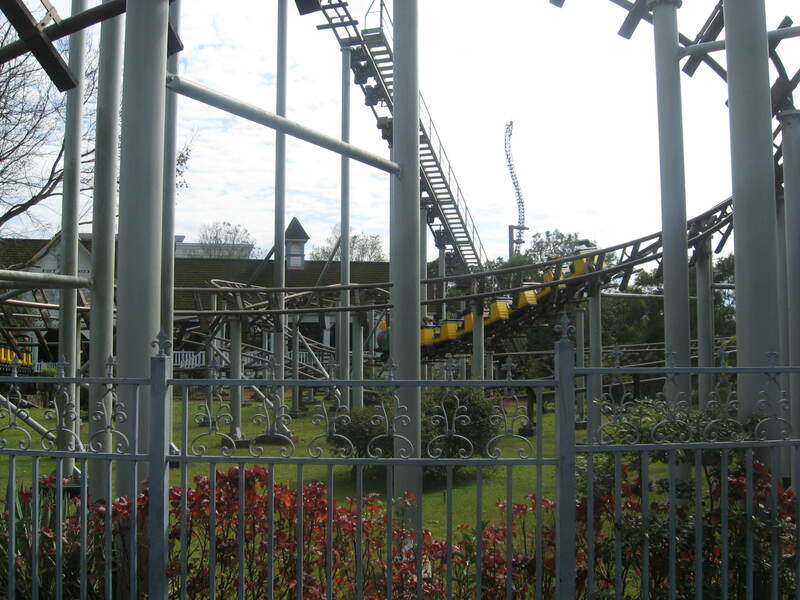 The first Junior Coaster 207m (207 meters or 679 feet) opened as Achterbahn at Rastiland (Salhzemmendorf, Germany) and the first custom Junior Coaster as Terror Train at Planet FunFun, a now closed park in Kerava, Finland. The ride was moved in 1996 to Fort Fun Abenteuerland (Wasserfall, Germany) where another company modified the supports to work with its new home hilly location. The lift hill that use pairs of pusher tires. The original Junior Coaster restraint as seen on Gadget Go Coaster at Disneyland (Anaheim, CA). The ride opened in 1993 and is a 207 Meters Junior Coaster. The ride features custom supports and a train with accorn shaped cars. 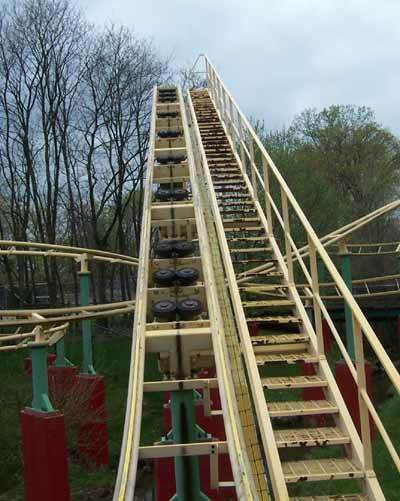 The lift hill was modified with pneumatic brakes versus the standard 207 Meters Junior Coaster. This is because Gadget Go Coaster has a a transfer track and the train has to be held on the lift hill to allow maintenance the time to slide the transfer track over. The train can then get maintenance in a more comfortable setting then the station or braking area. In 2000, Kijima Kogen (Beppu, Japan) opened a 207m Junior Coaster. Roller Skater has a beautiful location on top of a mountain. Flying Unicorn also opened in 2000 at Islands of Adventure (Orlando, FL). It was a two train 335m Junior Coaster and in 2010, it reopened as the Flight of the Hippogriff. Universal changed the theme of the attraction and replaced the original Unicorn cars with new Hippogriff cars. The new cars look like they were homemade with wicker. Hagrid’s Hut was constructed near the attraction. The Barnstormer at the Magic Kingdom (Lake Buena Vista, FL) originally had a crop duster plane gone crazy theme; when they renovated Toontown in an extension of Fantasyland, it was changed. The new theme is that the Great Goofini invites us to ride with him aboard his stunt airplane and as you can see with the billboard, the result is as expected. The Barnstormer is unique in that to allow it to operate even in the rain, the traditional pusher tire lift hill was replaced with a traditional chain lift hill. It also features this sliding track switch at the exit of the station. The ride has three trains and can operate with two at a time. As you can see, a second track switch is present to send the train to the correct maintenance bay. The existing trains were refurbished and the lap bar padded for more comfort. Those brakes are not from Vekoma, but a creation of the engineering department at Disneyland Paris. Instead of the long pads that have to be remove from the brakes when they need to be inspected or changed, they went with small tape cassette sized pads. Those pads are made of Bronze and can easily be removed or installed on the spot. The first roller coaster to feature those was Space Mountain: De la Terre a la Lune at Disneyland Paris. Motorcycles and clowns were the theme of 2004 at Vekoma. As part of their largest expansion, Bobbejaanland in Lichtaart, Belgium opened a new custom Junior Coaster. The custom ride features a 54 feet tall lift hill and 1466 feet of track. Elements include a camelback hill and a “junior Butterfly”, which is a banked Pretzel shaped turnaround. Two trains were supplied and those are a whole new style, allowing two adults to sit comfortably in a car. The original ratcheting lap bar was also replaced by individual U shaped hydraulically operated restraints. This became the new standard for every new Junior Coaster installation. It was called Junior Coaster in 2004 and was soon renamed “Oki-Doki”, to go with the clown face design on the cars. The new cars were called MK-701. Promotional picture for the Junior Coaster/Oki Doki at Bobbejaanland. 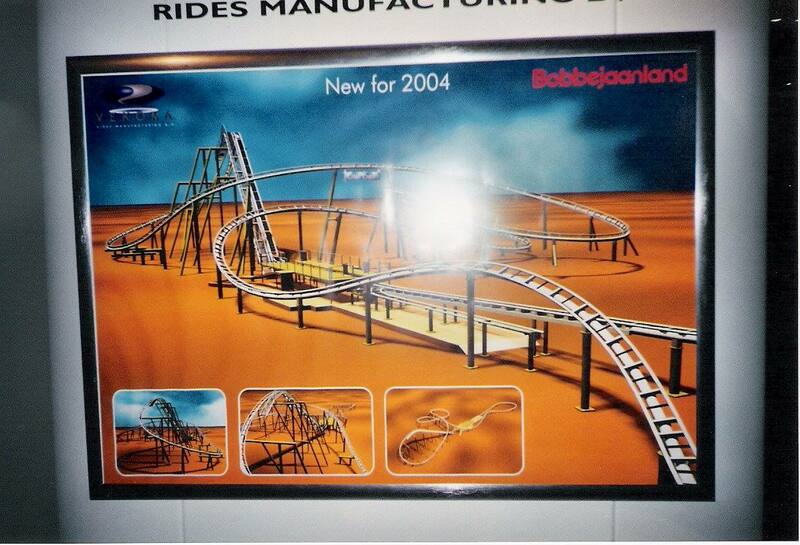 It was shown at IAAPA 2003. The New restraints on the MK-701 car. The two pictures are from the 2010 “Enchanted Airways” custom Junior Coaster at Universal Studios Singapore. It can run two trains and the second picture show the front car sticking out of the covered transfer track. A sliding track switch is used to transfer trains. Flight of the Hippogriff opened in 2014 at Universal Studios Japan (Osaka, Japan). It features the same layout as the original one at Islands of Adventure, but it has the newer MK-701 cars. To make it easier for taller guests, the team member will try to assign them to the front row, which features a lot more leg room. Eddy-current magnetic brakes help make the end of the ride a smooth and comfortable experience. 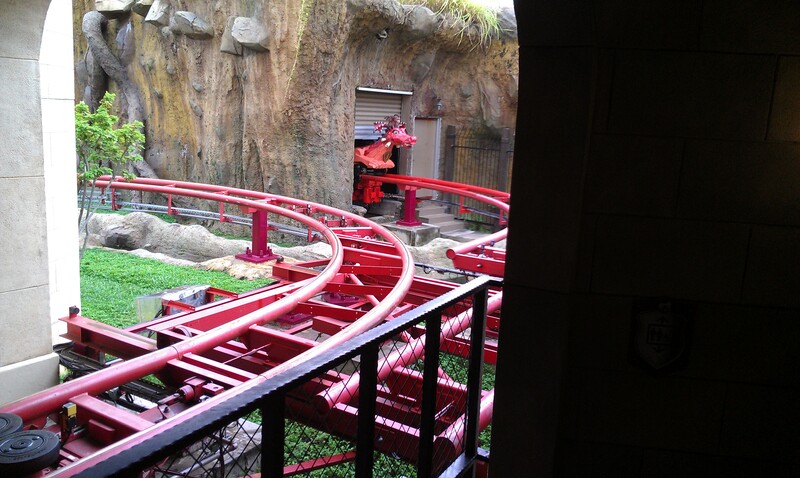 The train in the middle of the first drop. This flat platform at the back of the train is used to transfer wheelchairs from the loading side of the station to the unload.